NoVa Tea Party Patriots: Obama's approval rating .. Change! Obama's approval rating .. Change! 46% of voters say they at least somewhat approve of the President's performance. 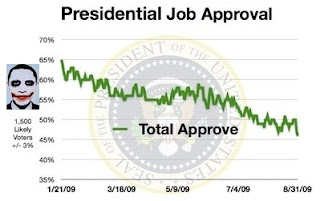 That’s the lowest level of total approval yet measured for Obama. Fifty-three percent (53%) now disapprove. Eighty-one percent (81%) of Democrats approve while 83% of Republicans disapprove. As for those not affiliated with either major party, 66% disapprove. See other recent demographic highlights from the tracking polls.